The three men have two things in common: all are relatively young and all are on fire for the Lord. Sean Loomis, 28, brings to his priesthood a very special gift. He is a convert to Catholicism, and those converts who arrive at the faith after careful thought rather than a family legacy are to be envied. They have a fervor and certitude that is hard to match. The son of Frank and Janice (Hee) Loomis, Sean was born in Stuttgart, Germany while his dad was in the military. He has one sister, Heather. Although he was baptized in the Episcopal faith, he really was not exposed to religion as a child. He attended Oakmont Elementary School in Havertown, Haverford Middle School and Haverford High School before going on to Kutztown University with the idea of majoring in education for an ultimate career as an English teacher. Sean had a typical fulfilling social life including dating, though nothing serious, and a circle of good friends. But he began thinking life must have a God-given purpose, and on examination, he found the explanation of faith given by the Catholic Church best compatible with his own life experience. It also helped that his best friend in high school had been Drew Zagursky, who was a very strong, committed Catholic, living the faith. 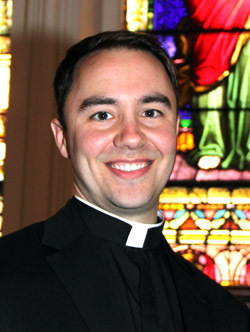 Through the Newman Club at Kutztown he received his RCIA instruction during his sophomore year and was received into the Church at St. Denis Parish in Havertown, which would be his home parish. Desiring an even deeper Catholic experience, he attended a retreat in Ireland, and it was at this time the Lord first spoke to him, telling Sean He wanted him to be a priest. Because of this he transferred to Franciscan University in Steubenville, Ohio, continuing his studies in catechesis and earning a degree in philosophy. His parents were a bit apprehensive about his plans. They worried he might be too young to make such a decision, but they ultimately became comfortable with his choice. As a matter of fact his father also became Catholic. 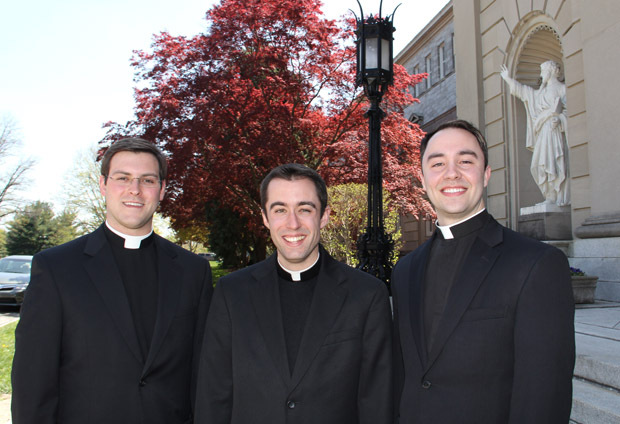 Sean entered St. Charles Borromeo Seminary after his Franciscan U graduation, and if there were moments when he questioned his choice, always the answer came back that this was what God wanted of him. He was bolstered through his daily rosary and such favorite saints as Therese of Lisieux, Louis de Montfort and the Blessed Virgin, “who is the woman in my life,” Sean said. John Stokely, 26, zeroed in on his future vocation early in life. Make that very early in life. He was 6 when he decided he wanted to be a priest, and has stuck to it ever since. The son and only child of Patrick and Joan (Rafalowski) Stokely, he was baptized at St. Kevin Church, Springfield, but raised in St. Peter and Paul Parish, West Chester. It was while attending Sunday Mass as a little fellow that he was awestruck by the priest celebrant. With the innocence of a little child he literally thought of the priest as Jesus, which in a theological sense isn’t far from the truth. “I wanted to do the same thing,” he said. It wasn’t a passing fancy, and the determination stayed with him all the way through St. Aloysius Academy, Bryn Mawr, and Bishop Shanahan High School, Downingtown. Certainly there were times when he thought of other vocations, but at the core the priesthood was always there, even if he never confided this to his friends or classmates. His parents knew, and fully supported his choice. 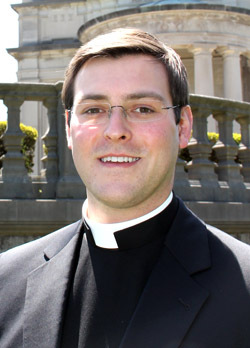 He entered St. Charles Seminary in 2005. This past year as a deacon he served at St. John the Evangelist Parish, Morrisville, under the guidance of Msgr. Joseph Prior. “It was a tremendous blessing because he was rector of St. Charles Seminary when I entered and now I ended with him at St. John,” he said. 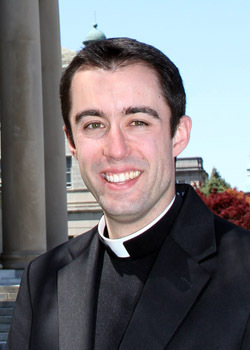 Other priests who were especially helpful in his seminary journey were Father Peter DiMaria as a freshman and Father James McGuinn as a sophomore; and before his entry Bishop Michael Burbidge, who was the rector at the time. “From the first time I visited there he encouraged me to become a priest,” he said. The real challenge for all newly ordained priests is maintaining the fervor they bring to ordination. His own prayer life includes devotion to the Sacred Heart of Jesus, St. John Neumann and the Blessed Virgin. “I think as long as a priest continues to pray every day, celebrate the Eucharist and pray the Liturgy of the Hours that will help him stay on fire with love of God and love of the Church,” he said. Thomas Viviano, 31, had work experience as a teacher behind him before discovering God wanted something more of him. The son of Thomas and Mary Alice (Gregory) Viviano, he has a younger brother and sister. After grade school at St. John Bosco Parish, Hatboro, and Archbishop Wood High School, Warminster, he entered DeSales University in Center Valley, Pa., where he majored in Spanish and English as a Second Language. His roommate at DeSales went on to enter the Oblates of St. Francis de Sales, but at that point, although the priesthood had at times entered his mind as a possibility, he considered teaching would be his vocation. After taking his degree in Spanish he took a position at Abington Senior High School where he taught Spanish, and began working on his master’s in English as a Second Language. Again, like other young men he dated. He also started to become more involved in his parish, something he had done on a more limited basis during his high school and undergraduate college years. At St. John Bosco Parish he was especially influenced by Fathers Martin Cioppi and Gerald Ronan, who were both new to the parish in these years of his deepening faith. “They were great role models,” he said. Through this experience he slowly came to realize that while teaching was a wonderful career, it was not enough for him. Slowly his vocation grew and blossomed into an ultimate desire to give everything to the Church. He entered his fourth year at Abington knowing it would be his last, and entered St. Charles Seminary in 2007. Although seminary life was a bit of a surprise because of how demanding it is of one’s time, he never considered leaving. He loved the spirituality and expects that will continue throughout his life. His deacon year was spent at St. Patrick Parish in Norristown, which was a perfect fit because of the large Hispanic community the parish serves. He knows living the life of a faithful priest is not easy in a culture that is heading in the opposite direction. “The challenge is to preach the Gospel,” he said. For himself, dedication to the Mass, the Liturgy of the Hours and a daily holy hour are essential. “A priest needs to be nourished if he is going to go out and preach,” he said. Thomas fully intends to continue a regimen that includes meditation, Scripture and contemplation as much as possible before the Blessed Sacrament. I hope the entire Diocese prays constantly for these courageouos young men who domonstrate the virtue of total and life long commitment for the love of God. May their commitment be joyfully renewed in their Golden Jubilee fifty years from now. May they know God’s love intimately throughout their priesthood. And, may they celebrate the reception of that love and commitment they have shown through the people to whom they minister.